I’ve got a question for you today, slightly different approach. 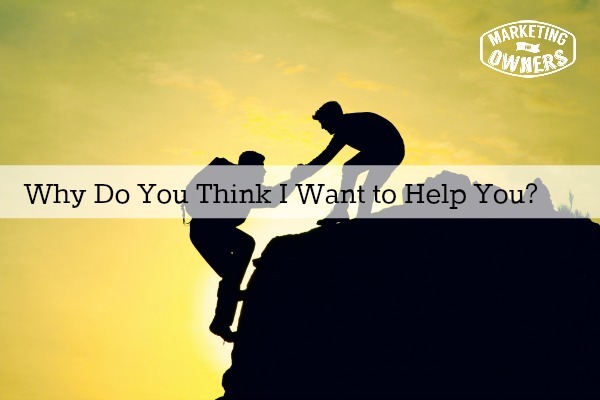 Okay, I want to know why do you think I want to help you? Aha! Turn the tables, eh? Weren’t expecting that one when you got up and made your cup of tea this morning. Well, the reason I asked is because I’m just wondering. I need to know so I can give you information and this is to help your business but just have interest when you listen, what do you think? Are you thinking, “Jon — does he has an ulterior motive”? or, “He is going to be able to get my credit card details and send loads of money up to Nigeria” or “I’m going to kidnap your children” or something like that. N0 — none of those things. I just wonder because there is no ulterior motive. Let me tell you why I like giving out information. I am passionate about this stuff. When I left school, I didn’t really know what I wanted to do and I fell into business. I just picked up a job, selling fire extinguishers door to door. When I applied for the job, I didn’t even know what I was selling. I was 18, I was young, I was naive, and it was great and that was 1984, yes, I’m old, sorry, but I worked my way through to 30 years later to where I am now–where I’ve built and sold a business and I then built other businesses and they do kind of well and I don’t even have to go to work and my business still do well. In fact, you can set your own right now. I actually generally work from home even though I’ve got a building that I own. I have two businesses based in there and we have staff. Now, I am incredibly lazy and my entire business has been built on the basis that I don’t actually want to do any work and so I figured out ways to get other people to do the work that I need to have done. I have good ideas as to how the work needs to be done then I get other people in to do it and show them how I want it to be done. How quite obviously I should be doing it if I wasn’t so lazy and it all builds up from there. Each time I get that job done I’m then thinking of the next job because I have an active mind and that’s the way it’s developed. So, we do a few million in fire safety gear every year, so that’s pretty cool. We have a single sales person. Now, these processes are applied to everything so the same process we use in the fire protection business is what I used in Marketing For Owners. It bears no relation, nothing apart from it uses modern marketing, it uses the internet but it doesn’t have to use the internet. I speak to people for real. So in a couple of hours I’m going into Canterbury to see a friend of mine who is in marketing and he is a great friend actually. We chat, we have drinks and it’s kind of like a mentoring thing. Bringing their marketing into the modern world and showing some tips that he gradually applies to customers and he finds it works. It takes a while but that always gets us extra lunches and I’m pretty sure I always pay. I think maybe he does sometimes but, I cannot help but help him and the reason for that is because from the outside I can see how easy these systems are to build. He doesn’t ask for it by the way, and I don’t just force it on him. It just works. How really easy? I’m not a techie. I’m really, really not. I can do stuff because I have to do it but I’m not a programmer. I mean when my computer goes blah, I’m exactly the same as you. I will get someone to fix it. I don’t take it apart or buy up a new one but I am not technical. It just doesn’t interest me. I couldn’t care less about all that stuff. I just want it easy that is why our website uses Rainmaker. We can use word press and the plugins and all the things recommend, but we take it cost a little bit more but the hassle it saves. We just use Rainmaker. If you go to the marketingforowners.com website, scroll all the way down to the bottom, and there is a link that says powered by Rainmaker. Just click that and follow then you find out what that does. It will do the same for you but I normally recommend it to people because people think “Oh, look at the process of that” but seriously, I want an easy life. That’s what I do. I want to show you what I found out. It is great. If you apply just a tiny bit of what I can tell you, you will start to see changes. It will not happen overnight. Please listen, the best way to do it… the best way to find out is go to marketingforowners.com/join. You can also download our Tolls Report. If you go to the marketingforowners.com/71, you will be able to download it. Then you will get a series of autoresponders which can teach you things for free. This is going to help, it does not matter whether you’re in Canada, the United States, Australia, India, or in good old Great Britain. It’s going to help. I have no other reason other than the fact of what I know, I know is easy and I just think “Ah, please everybody listen, please. Try this stuff. Make yourselves some money. Half the time that you spend at work, but you will make twice or three times as much profit. That’s how it’s going to work. Today for Friendly Follow, I am going to give you an email service to follow — @aweber. We use Aweber all the time, but we also use mail chimp. 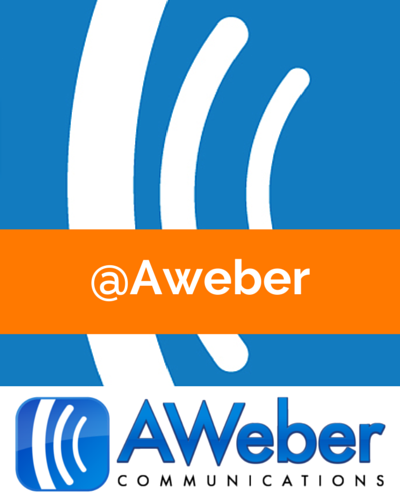 There are quite a few email service provider lists but Aweber is my favorite and I like their twitter handle. I like following it, like seeing what they do. They specialize in email marketing. They will put you on to lots of great content and they actually have a lot of good content on their own blog but I enjoy it. It is very informative, it had one special niche subject and if you want an expert on email marketing who better to ask than an email marketing company? Well worth to follow.